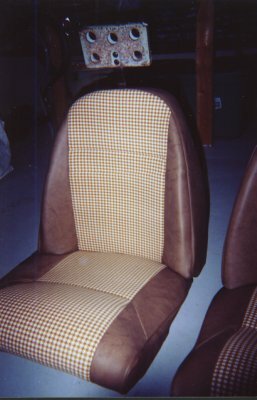 This was my first attempt at restoring seats so i'm not an expert on the subject, but I can tell you about my experiences. I found that it IS possible to do the seats yourself, and come out with good results. If possible, do one seat at a time, so when it comes time to put them back together you have something to go by. You may really have to pull the covers to get a tight fit over the foam. If you are in a cool place, using a hairdryer will heat up the vinyl making it stretch easier. The bottom foams are "handed" so you want to make sure you get them on the correct side.